Fanuc claims that it is the first robot manufacturer to produce a heavy-duty robot designed to work safely alongside humans. Its CR-35iA robot can perform tasks involving payloads of up to 35kg without needing the protective guards and fences that have previously been needed for robots with similar lifting capacities. Although there are already several other collaborative robots on the market, most are designed for much lower payloads. The new robot will stop automatically if it touches a human operator. A soft covering material also reduces the force of any impacts and prevents human operators from being pinched by the mechanism. And if the robot comes too close to an operator, they can simply push it away. 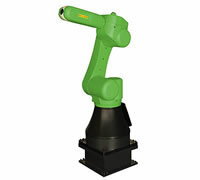 The covering has a green colour to distinguish it from Fanuc’s usual yellow robots. The six-axis robot is designed for duties such as transferring heavy workpieces or assembling parts. By avoiding the need for safety barriers, it is claimed to improve production efficiencies and allow higher levels of automation.